A space city needs its fiber...and giant kelp grows up to 2 feet per day. This next update will see some basic farming mechanics. Build kelp farm pods and kelp will slowly grow. This produces small amounts of oxygen, and worker drones will eventually harvest the kelp. 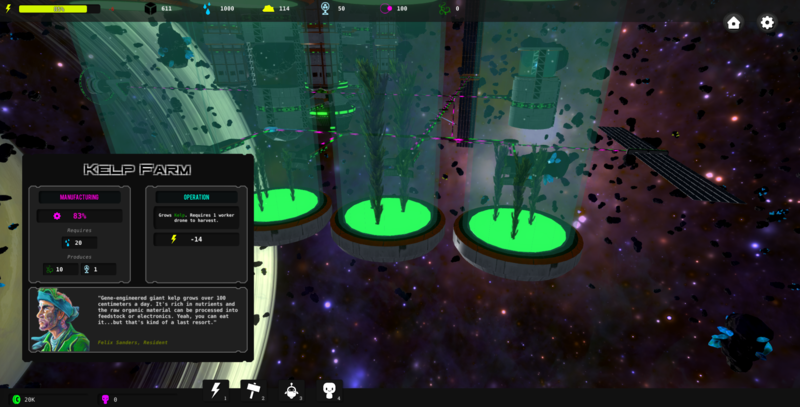 Kelp will be used to support population and can be used to create other advanced goods or traded. Various UI updates will be coming to support many more 'advanced' goods and better organize the existing resources. I'm still thinking/designing the more advanced elements of the economy like trade. If you have any suggestions or ideas, please let me know! This next update will be coming soon. I'm adding a lot more to this than I intended, and would rather wait until things are smoothed out before patching. There's a brand new UI and a host of new resources. You'll find a new asteroid type that yields precious metals (gold, platinum, etc.) and structures like the kelp farm that slowly grows plants. When ready, worker drones come to harvest the crop. The new UI shows exactly which goods are needed as "inputs" for any factory or farm. An improved build menu shows actual model previews which should also help clean up the presentation. Trade will become an important facet of the game. Traders will automatically warp in and dock; many are small, independent ships living life across the stars. 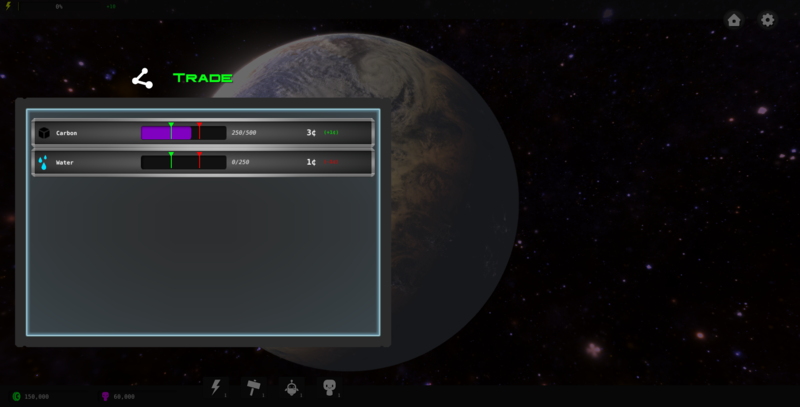 I am working on the interface to control trade -- set thresholds to automatically buy or sell your goods in storage. This reduces micromanagement. If your oxygen drops below the "buy" threshold, you will begin to buy it from traders. If you suddenly increase your O2 production and it then crosses the "sell" threshold, you'll begin to sell it to any interested traders. I expect most of these updates to be ready by next Tuesday (2/20) at the latest.